There are different ways to feed lambs, many ways. One method is not better than another. There are pros and cons associated with each feeding program. The appropriate feeding program is usually affected by geographic location, type of production system, marketing options, and cost and availability of feed. Lambs born in the winter are often creep-fed and finished on high concentrate diets, whereas lambs born later in the season (spring) are often placed on pasture (or range) with their dams. Some feeding programs utilize both pasture and grain. For the first several weeks of life, all a lamb needs for nourishment is its mother's milk. Lambs will start to nibble on solid food soon after birth. A ewe's milk production peaks between 3 and 4 weeks of lactation. By the time lambs are 4 to 6 weeks old, they may be obtaining as much as 50 percent of their nutrient intake from sources other than their mother's milk. Creep feeding is a means of supplying extra nutrition, usually grain, to nursing lambs. It is especially beneficial for lambs managed in intensive production systems in which early weaning is practiced. Creep feeding is also advantageous for flocks which have a lot of multiple births or in flocks where milk production is a limiting factor. It is more efficient to feed the lamb directly than to feed the ewes for milk production. Creep feeding is usually of less value for lambs that will be developed on pasture in the spring and summer. Creep feeding may not be cost-effective in all production systems. Lambs should be started on creep feed as soon after birth as possible, though they will not eat significant amounts of feed until they are at least three to four weeks old. Providing early access to creep feed gets lambs in the habit of eating dry feed and helps stimulate development of their rumens. It reduces the stress of early weaning. 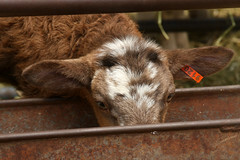 Lambs gain access to creep feed through a opening in a fence or gate. The opening must be large enough for the lambs to get through, but too small for the ewes, especially the thin ones, to enter. 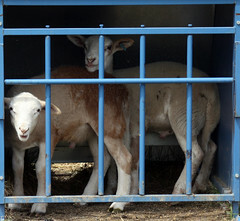 It is best that creep gates have multiple openings so the lambs do not think they are trapped. Ideally, the lambs should have access to the creep area from multiple sides. A small used tire can also be used as an inexpensive creep gate. 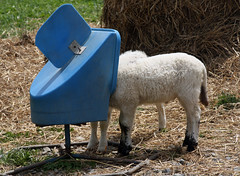 Feeders used in the creep area should be designed so that lambs cannot stand or play in them. The creep pen should be placed in a high traffic area where lambs will naturally find their way to it. A sunny spot in the barn is an ideal place to place the creep. A light will help to attract lambs at night. In addition to providing creep feed, the creep area is a place for lambs to loiter and sleep. It should be kept dry and well-bedded. Two square feet of space per lamb is recommended for the creep area. Each lamb should be allocated 2 inches of feeder space. Water should be available in the creep area, as well as high quality hay. Creep feeders can also be set up on pasture. The creep ration does not need to be complex or expensive. 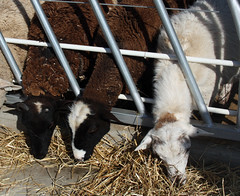 At a young age, lambs prefer feeds that are finely ground and have a small particle size. Feeds that have high palatability for lambs include soybean meal, ground or cracked corn, and alfalfa hay. Some producers start lambs out on soybean meal. It is expensive, but the lambs do not eat much at an early age. Crumbled or textured rations are consumed better than pelleted creep feeds. Some producers use the same feed that they feed their ewes. The feed should be fresh and dry and should never be allowed to run out. Because the growth of young lambs is mostly lean muscle (protein) rather than fat, protein supply is critical. The creep ration should contain 18 to 20 percent crude protein (at least 16 percent). The protein in creep feed should be all natural; urea should not be fed to young lambs. As lambs get older, they prefer coarser diets and whole grains. Older lambs deposit more fat, thus their requirement for protein diminishes. The creep feed should contain a calcium to phosphorus ratio of at least 2:1 to prevent urinary calculi (kidney stones) in male lambs, especially wethers. Inclusion of 1% feed grade limestone will also help to prevent urinary calculi. as a preventative for urinary calculi. Forage in the ration will also help to prevent formation of kidney stones. The creep feed should probably contain a coccidiostat to prevent coccidiosis, a protozoan infection that causes scours (diarrhea) and production loss. Deccox® (decoquinate) and Bovatec® (lasalocid) are both FDA-approved as coccidiostats for lambs (in confinement). Rumensin® (monensin) is another coccidiostat, but it is not FDA-approved for lambs. Lambs should be vaccinated with Clostridium perfringins C & D. There may be some benefit to mixing probiotics or essential oils into lamb rations; research is pending. Creep-fed lambs are commonly weaned early (< 90 days) and placed on high concentrate diets for finishing. Pasture-reared lambs must be brought gradually from a high roughage-low concentrate diet to a high concentrate-low roughage diet. This transition should take place over several weeks. When finishing lambs on high grain diets, acidosis, enterotoxemia, and urinary calculi can all be potential problems. Acidosis can be prevented by including at least 10 percent roughage in the diet, by feeding a rumen buffer (e.g. sodium bicarbonate), and by avoiding sudden changes in the type or amount of ration fed. Urinary calculi can be prevented by having a Ca:P ratio of at last 2:1, having a salt/mineral mix available free choice, and by feeding an urine acidifier like ammonium chloride. Getting lambs to drink plenty of water will also help to prevent urinary calculi. Lambs fed concentrate diets should be vaccinated twice for overeating disease. 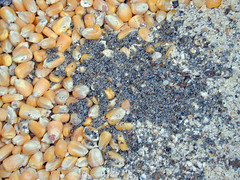 Corn and soybean meal commonly form the basis of these feed lot diets. However, other grains and protein sources can replace all or part of the corn and soybean meal in the diet, depending upon availability and cost. The energy value of barley and grain sorghum (milo) relative to corn is 90 percent. Both can replace 100 percent of the corn in the diet. Due to its higher fiber content, oats have only 80 percent of the energy value of corn. Wheat is equal to corn, but should not replace more than 50 percent of the corn or barley in the diet. Soy hull pellets can also form a significant portion of the feed lot diet. Alternative sources of protein include cottonseed meal and peanut meal. Urea (the end product of nitrogen metabolism) has a crude protein equivalent of 281 percent and can supply up to one-third of the nitrogen in the diet (of older lambs). To determine the pounds of nitrogen in the diet, you multiply the total pounds of crude protein in the diet by 16 percent. The decision to use other feeds should be based on their availability and cost relative to corn and soybean meal. To determine if other feeds are a better value than corn and/or soybean meal, comparisons must be based on the cost per unit of nutrient (protein and energy). Differences in weight and nutrient content need to be factored into these calculations. Whole-grain feeding of lambs improves feed efficiency, increases average daily gain, and lowers overall feed costs per pound of gain. It is usually the most profitable feeding program that can be used for grain-based finishing of feedlot lambs. Whole-grain diets consist of whole (unprocessed) grains, such as shelled corn or barley, mixed with a pelleted protein-vitamin-mineral supplement. With whole grain diets, it is usually not necessary to incorporate roughage (hay) into the diet or to supplemented it on the side. Consequently, whole-grain diets are high in energy and promote accelerated lamb gains. The feeding of whole grain provides lambs with a built-in "roughage factor." Only about one-third of the grain is cracked when first eaten by lambs. The remainder of the grain must be regurgitated during rumination for further mastication. This action of regurgitation and chewing contributes more saliva to the digestive process, thus increasing the buffering capacity of the rumen. Feeds containing processed grains must have roughage added to the grain mix or supplemented on the side to maintain proper rumen function and prevent digestive disorders. Pelleted supplements for whole-grain feeding are commercially available and are formulated to contain the additional protein, vitamins, and minerals required by lambs. When commercial supplements are not available, a custom pelleted supplement can be prepared. Because feed grains are low in calcium, it is critical that pelleted supplements contain additional calcium as a preventive for urinary calculi. Ammonium chloride or ammonium sulfate can be added to the pelleted supplement at a rate equivalent to 0.5% of the complete feed as additional insurance for the prevention of urinary calculi. In a self-feeding situation, lambs have feed in front of them at all times. With hand (or limit) feeding, a set amount of grain is fed twice per day at approximately the same time each day. There are pros and cons to each feeding system. Lambs that are self-fed will consume more feed and gain faster. Lambs that are hand-fed tend to make more efficient gains. It is easier to monitor animal health when lambs are hand-fed. 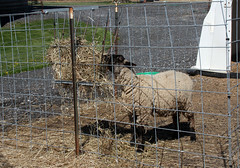 Hand feeding requires more feeder space per lamb (9-12 inches vs. 1-2 inches). 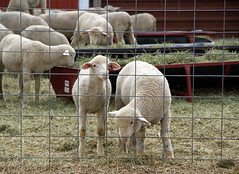 Hand-feeding requires more labor, so it is less common with larger lamb feeding operations, though hand-feeding can be automated. Regardless of the feeding program, abrupt changes to the ration should never be made. Self-feeders should not be allowed to run out. Ionophores are often added to the feed lot diet to improve lamb health. Antibiotics can no longer be fed to lambs. Ionophores (Deccox® and Bovatec®) are used to control coccidiosis in feed lot lambs. The use of both has been shown to improve lamb average daily gain and feed efficiency. Probiotics are the opposite of antibiotics. They are living organisms of beneficial bacteria. Yeast is a probiotic. Probiotics are also found naturally in fermented foods like yogurt with live cultures. Probiotics may improve animal performance by keeping livestock healthier and improving their digestion. Many commercial feeds contain probiotics. Milk replacers usually contain probiotics. There is limited research to attest to the benefits of probiotics in lamb diets. Recent research with meat goats showed no benefit to including probiotics in the diets of healthy growing kids. Though not a standard practice, implanting lambs with Ralgro® to improve growth rate is FDA-approved. Ralgro® is not a hormone or steroid. It is a plant extract (zeranol) that causes estrogen-like activity. 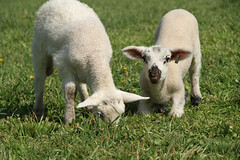 Ralgro® is a pellet that is injected subcutaneously into the lamb's ear. Lambs may be implanted more than once and may be marketed 40 days following injection of the last implant. The cost of a single implant is less than 75 cents. Implanted lambs tend to grow faster, be more efficient in their feed utilization, and produce heavier carcasses. Implanting produces various physiological changes in the lamb. It reduces the weight of the testicles in ram lambs and makes pelt removal during slaughter easier (an added benefit). Implanting causes increased bone mineralization or bone maturity and can result in older lambs being wrongly graded as mutton. Ewe lambs should probably not be implanted, especially if they will be kept for breeding. Implanting has been implicated as a contributing factor to rectal prolapses. Though pasture-fed lambs will usually not grow as fast as lambs fed concentrate diets, pasture rearing can be more economical. It is a more natural feed and environment for lambs. There seems to be a growing consumer demand for grass-fed animal products, due to the perceived health benefits. Grass-fed meat and milk tends to be lower in fat and higher in conjugated linoleic acid (CLA), vitamin E, omega-3 fatty acids, beta-carotene, and vitamin E than the meat and milk from grain-fed livestock. Regardless of diet, lamb is one of the best sources of CLA. Excellent pasture and grazing management is generally required to finish lambs on pasture. Lamb growth rates can vary greatly, depending upon the type and quality of pasture being grazed. 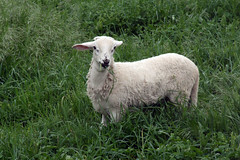 As pasture quality declines, lamb gains decline. Rotational grazing systems which result in lambs consuming plants in a vegetative state when they are the most nutritious and palatable, will produce the best pasture gains. Pastures containing legumes usually produce better gains than those containing grass alone. The inclusion of warm season grasses into the pasture system may improve summer gains, as cool season grasses don't grow much during the summer months. Legumes will also improve summer growth of pastures. 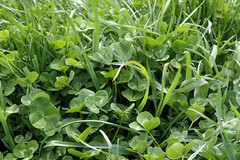 Lambs grazing"novel endophyte" (MaxQ) or non-toxic endophyte strains of tall fescue can be expected to gain better than those grazing infected fescue varieties. The initial grazing trials with MaxQ tall fescue were done with lambs. Lambs grazing Max Q or endophyte-free tall fescue gained 0.37 lbs. per day vs. lambs grazing endophyte-infected fall fescue, which gained only 0.22 lbs. per day. Over a typical May to September grazing season, lambs tend to gain about one-third of a pound per day on traditional cool season pastures (Pennsylvania, West Virginia, and Maryland data). Internal parasites (gastro-intestinal worms) can have a significant effect on the health, welfare, and performance of grazing lambs. Traditional rotational and intensive grazing systems may exacerbate internal parasite problems, if pasture rest periods are not sufficient. In the past, it was advocated that grazing lambs be dewormed every three to four weeks during the grazing season. This practice has contributed to the widespread emergence of drug-resistance worms, making parasite control with anthelmintics more difficult and costly. Effective internal parasite control requires an integrated approach that combines appropriate pasture and animal management strategies with selective and/or targeted use of anthelmintics. Some forages have anthelmintic-like activity (e.g. sericea lespedeza, birdsfoot trefoil, and chicory) and can be incorporated into a pasture and grazing program. In 2019, BioWorma® became available in the US. BioWorma® contains a nematode-trapping fungus called Duddingtonia flagrans. It is a feed-through product that reduces pasture infectivity. While coccidiosis is generally considered to be more of a problem with confined lambs, outbreaks can occur on pasture, especially with intensive grazing programs, where more lambs are concentrated on a smaller land area. In fact, any place where livestock congregate can be a potential source of infection: laneways, sheltering areas, watering areas, feeding areas. A coccidiostat (Bovatec® or Deccox®) in the mineral mix will help to prevent outbreaks of coccidiosis. Lambs can also be given anti-coccidia drugs in drenches. Grazing lambs are more susceptible to predation than those raised in confinement or drylot. Predator control begins with a good fence. Various management strategies can reduce the risk of predation, e.g. shed lambing and night penning. 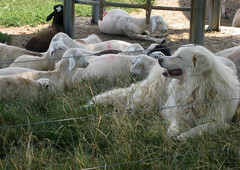 The use of livestock guardians (guardian dogs, llamas, or donkeys) has proven effective on many farms and ranches. Lethal control methods (shooting, trapping, toxic collars) may be necessary in some circumstances. Pasture gains can be improved with supplementation. Supplementation makes the most sense when pasture quality is low. Supplementation will also help to stretch the pasture resource and/or allow increased stocking rates. Supplementation offers some of the same advantages as feed lot feeding, but without diminishing the benefits of a pasture diet. Supplementation may or may not be cost-effective. Most of the research done with pasture supplementation has been done with cattle. Some has been done with lambs in Europe and New Zealand. It is usually suggested that livestock be fed no more than 1% of their body weight in supplement. Research with cattle suggests that supplementation with feedstuffs that are high in starch, such as grain, reduces forage digestibility, as compared to energy supplements with highly digestible fiber sources (soybean hulls, corn gluten meal). Grain-fed lambs grow faster and reach market weight quicker. American consumers tend to prefer the milder flavor of grain-fed lamb. It is easier to monitor animal health in a grain-feeding situation. Internal parasites are not usually a problem in drylot feeding areas. Grain finishing of lambs allows the producer to use pasture for the ewe flock and maintain more ewes. Grain-fed lambs tend to bring a higher price at salebarns. Grain, hay, and silage can be a more economical feed choice in areas where land and fencing costs are high. Pasture is a more natural diet and environment for lambs. 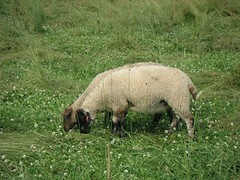 Pasture-fed lambs tend to produce leaner carcasses. The meat from grass-fed livestock usually contains more conjugated linoleic acid (CLA), vitamin E, omega-3 fatty acids, beta-carotene, and vitamin A than the meat from grain-fed livestock. There is a growing consumer demand for grass-fed meat and milk. Pasture gains tend to be more economical. 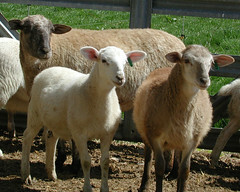 Fewer digestive problems are encountered when lambs are pastured. Grain-fed lambs usually produce fatter carcasses. 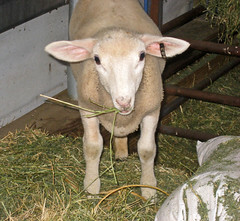 Grain-fed lambs are subject to various digestive disturbances. Some breeds (e.g. hair sheep) are not well-suited to a high concentrate diets because they deposit their fat internally first. Concentrated feeding areas tend to be more detrimental to the environment due to concentrated animal numbers and the potential for runoff. Large feed lots require permits to operate. Pasture-fed lambs are more susceptible to internal parasites. Pasture-fed lambs are more vulnerable to predators. 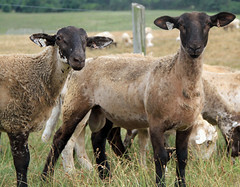 Pasture-fed lambs usually grow slower and take longer to reach market weight. 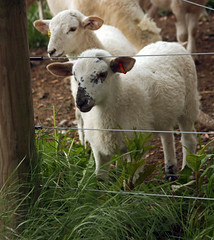 Many grass-fed lambs are often not able to reach their genetic potential for growth. Pasture-fed lambs may need some grain feeding to reach slaughter condition for some markets. More pasture is needed for the sheep enterprise if lambs will be grazed.